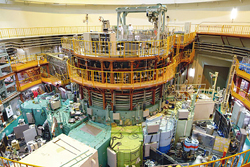 Since 1961, the ISSP has been playing a central role in neutron scattering activities in Japan not only by performing its own research programs but also by providing a general user program for the university owned various neutron scattering spectrometers installed at the research reactor of JAEA (Tokai). In the JRR-3 reactor (20MW), the university group owns 14 spectrometers, and the Neutron Science Laboratory (NSL) is conducting the general user program. Furthermore the NSL owns state-of-art inelastic neutron scattering spectrometer HRC in J-PARC which started its operation in 2009. Major research areas supported by NSL user program are solid state physics (strongly correlated electron systems, high-Tc superconductors, heavy fermion systems, low dimensional magnetism, high-pressure physics, etc. ), fundamental physics and neutron beam optics, structure and phase transitions of polymers, gels, and colloidal systems, physical chemistry of complex condensed matter, structure and functions of biological systems, and material sciences. The NSL also operates the U.S.-Japan cooperative program on neutron scattering, and supports the development of the neutron-beam-based material sciences in Japan. Materials Design and Characterization Lab. Neutron Science Lab. International MegaGauss Science Lab. Center of Computational Materials Science Laser and Synchrotron Research Center Synchrotron Radiation Lab.